Skimmer Lids If you're looking to conceal a skimmer, waterfall filter or diffuser, using real stone can sometimes be unmanageable. Utilizing a lightweight fake stone is a better option. Available in a variety of sizes and finishes that fit into any region. 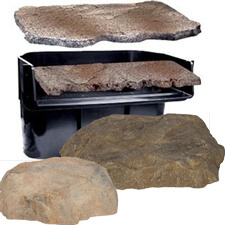 These decorative covers have a stone-like appearance and are extremely lightweight. Blends well with most surroundings. Manufactured from fiberglass, these rock lids are extremely strong yet lightweight. Molded from real stones and individually painted, each stone is authentic.